Charming home w/ fireplace & private washer/dryer, close to river & bike path! Downtown Durango is at your fingertips when you book this lovely two-bedroom vacation rental. Just one block from the Animas River, this home-away-from-home boasts all of the standard comforts, including a private washer/dryer, free wireless internet, and a wood-burning fireplace. The Durango Public Library is a few minutes' walk away, next to a bike path that hugs the banks of the Animas River. Downtown Durango is a little more than a mile away via the bike path, or half a mile by car. Purgatory Resort is 26 miles away, and Mesa Verde National Park is 36 miles west. 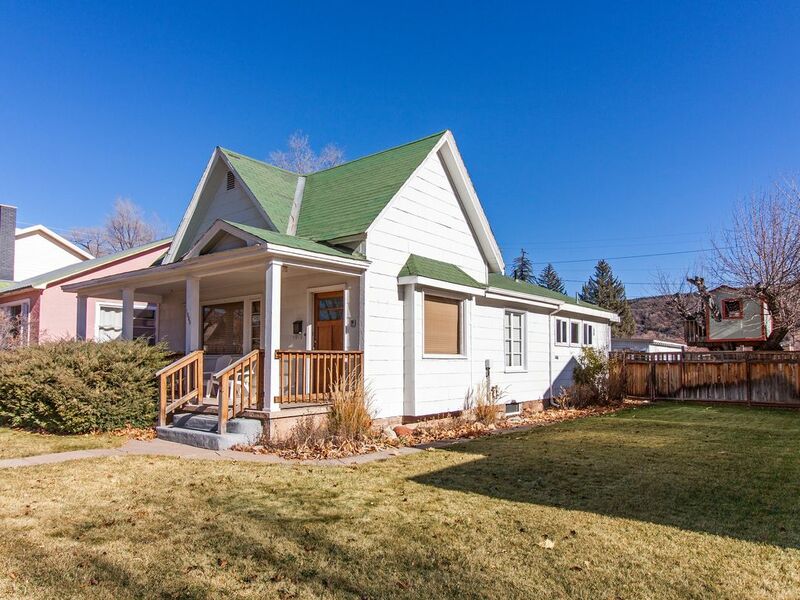 Situated on one of Durango's quiet residential streets, this cozy home is the perfect no-frills retreat for a small family or two couples who want easy access to the city's attractions. Bright and airy with modern decor, this home has everything you need for a successful vacation. The home features a spacious living room with a large sectional sofa, which faces the wood-burning fireplace and the wall-mounted flatscreen TV. On cold evenings, what could be better than browsing the cable channels while you luxuriate in the warmth of a fire? If you feel like cooking, the fully equipped galley-style kitchen is ready for everything from a leisurely brunch to a quick pre-adventure snack. There's even a dishwasher for easy cleanup. A dining room table seats five. Up to four guests are welcome to stay at this two-bedroom, one-bathroom home. Each bedroom features a queen-size bed. One of the bedrooms overlooks the fenced backyard. Whatever you're interested in, Durango has something to offer you. Hop on your bike and head downtown, enjoying scenic views of the Animas River as you coast along the path. Stroll along the city streets, perusing museums, art galleries, and shops, before stopping for a bite to eat or a beer from one of the local breweries. During the winter, head north to Purgatory Resort for skiing, snowboarding, dog sledding, sleigh rides, and snowshoe tours. In summer, go for a hike in Mesa Verde National Park and explore the Ancestral Puebloan cliff dwellings, then cool off with a rafting trip down the Animas River. However you choose to spend your time in Southwest Colorado, you're guaranteed to have an unforgettable trip. Don't miss out on this convenient Durango vacation rental! We thoroughly enjoyed our stay! Plenty of room for the 4 of us with everything we needed stocked. The only thing that we were bummed about was that we couldn’t get the fireplace to open, so we were unable to use it. Not sure if it was. locked or jammed, but it would have been nice to have a fire as it snowed our first night there. Besides that, we loved everything! It was so close to downtown and easily walkable to several places. Would stay here again! We are sorry to see our guest was unable to use the fireplace and wish they had called for assistance. We hope to see them again! Loved the location. Kitchen well equipped. Beds comfortable. Heat & air worked well. Could do with a small patio in the back yard & a grill. The house was exactly as advertised - location was great to downtown, neighborhood was great, and being in Durango was wonderful. Home and location were great. There are some minor maintenance issues - light bulbs being burned out, carpet stained in a number of places, floor tiles cracked in the kitchen but overall home was comfy and clean. Great location. Bad parking, neighbors take the spaces. Beds/pillows sheets uncomfortable. House/porch needed a good cleaning. Fan in bathroom and back gate not working. Nosy neighbors next door and rowdy college kids on other side. Could be a great house but needs improvement!